Carpenter ants are the largest commonly found ant species in the United States. Their size generally ranges between 3.5 and 15 mm long. Most carpenter ants are black, but there are some species with red and yellow markings. They live both indoor and outdoor, preferring to make their homes within moist or rotted wood. 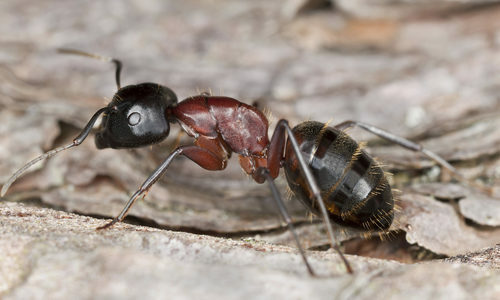 Carpenter ants don’t eat the wood they cut into with their large mandibles, and instead prefer food pilfered from humans like sweets, meat, and the like. If those food sources aren’t available, they’ll branch out to feed on other insects. Working carpenter ants complete their entire life cycle in just between 1.5 and 3 months, but in a good environment, queens can live up to 25 years and have hundreds and hundreds of children in their lifetime. Carpenter ants aren’t known as common spreaders of disease or infections, but that doesn’t mean they are without their own particular dangers. They will bite if they feel threatened, but it’s not common, and they contain no venom. However, what they can do is cause serious structural damage to homes they’ve infested because they make their nests in wood. Any wood, especially untreated wood in your home, is in danger from being consumed. You have carpenter ants because your home or business has proven to be an appealing place for them to lay eggs and reproduce. They like human food so paying special attention to clean up after cooking, airtight storage of leftovers, and regular clean-up on garbage disposals and containers can go a long way toward keeping them out. One other thing we recommend you do is avoid the use of raw wood for any furnishing within your home. Getting rid of carpenter ants is extremely difficult since they infest areas you can’t openly see like the insides of furniture and the wooden structures that hold up your home. Preventing carpenter ants is difficult, since if you only eliminate a satellite colony, they will frequently find a way back in and re-infest your home. The best way to take care of an ant problem like the ones that carpenter ants present is to call a pest control professional. That aside, you can keep carpenter ants from targeting your home by only utilizing treated wood and storing all your edible leftovers in tightly sealed plastic containers, regularly clean and take out the garbage, and pay special attention to potential outside entry points. How can Gregory Pest remove carpenter ants from my home or business? Our experts at Gregory Pest Solutions will assess the situation and formulate a plan to stop carpenter ants at the source, so they don’t return. Unlike an average ant extermination company, we inspect and find the source of your problem, determine the best course of action, and then implement an effective and eco-friendly solution to get rid of ants in your location for good. When you hire us to evaluate how extensive your home’s pest problem is, one of our pros will be sent to assess the ant situation and then formulate an environmentally friendly plan for removal and prevention. Once we implement our plan, our experts will clean the area and seal any openings that are prime for future entry so that you and your family can enjoy a lasting pest-free environment.